A number of occasions in the autumn, but especially in the spring we have introduction for you who are unsure of how to cycle in a group. Hisingens Cykelklubb will guide you through all the terms and news you encounter as a novice. You get all the conditions for growing your bicycle interest. It starts with a theoretical review in the clubhouse at Hisingen. There are presented basics and signs that are important in clipping. All in order for you to be able to follow and ride the regular rounds the next time. If you do not have a race bike but would like to try out, there are bikes for lending to club rounds from Hisingen Club Club Room. These are intended for approximately: 150-185 cm long cyclists and have combo pedals so it works with regular shoes and / or SPD clips. Booking is via notification in the intended thread on Facebook. (first come). 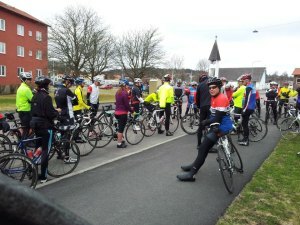 So regardless of whether the reason is to improve health, fitness, exercise, burn fat, lose weight, exercise for Hisingen Runt, Västkusten Runt or any other challenging exercise or personal goal, cycling is a great way to do this. The only requirement is that you have a helmet and follow the club’s policy.